272 pages | 56 B/W Illus. This interdisciplinary study offers a comprehensive analysis of the transition economies of Central and Eastern Europe and the former Soviet Union. Providing full historical context and drawing on a wide range of literature, this book explores the continuous economic and social transformation of the post-socialist world. While the future is yet to be determined, understanding the present phase of transformation is critical. The book’s core exploration evolves along three pivots of competitive economic structure, institutional change, and social welfare. The main elements include analysis of the emergence of the socialist economic model; its adaptations through the twentieth century; discussion of the 1990s market transition reforms; post-2008 crisis development; and the social and economic diversity in the region today. With an appreciation for country specifics, the book also considers the urgent problems of social policy, poverty, income inequality, and labor migration. Transition Economies will aid students, researchers and policy makers working on the problems of comparative economics, economic development, economic history, economic systems transition, international political economy, as well as specialists in post-Soviet and Central and Eastern European regional studies. 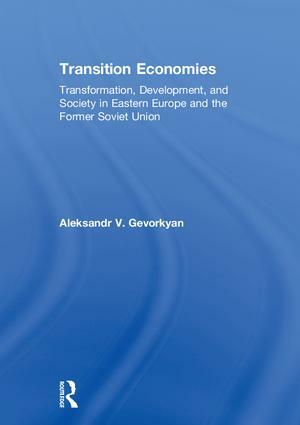 “A new book on transition economies, with a strong historical perspective, knowledge of the area and languages, lots of empirics and discussion of new issues like migration and remittances.” - Branko Milanovic, Visiting Presidential Professor, Graduate Center - CUNY; Former Lead Economist, World Bank Research Department. Aleksandr V. Gevorkyan is Associate Professor of Economics at the Department of Economics and Finance of the Peter J. Tobin College of Business at St. John’s University, USA. His research covers themes in open economy macroeconomics, economic development, international financial economics, and post-socialist transition economics.